Resistors play a fundamental role in our electronic components. 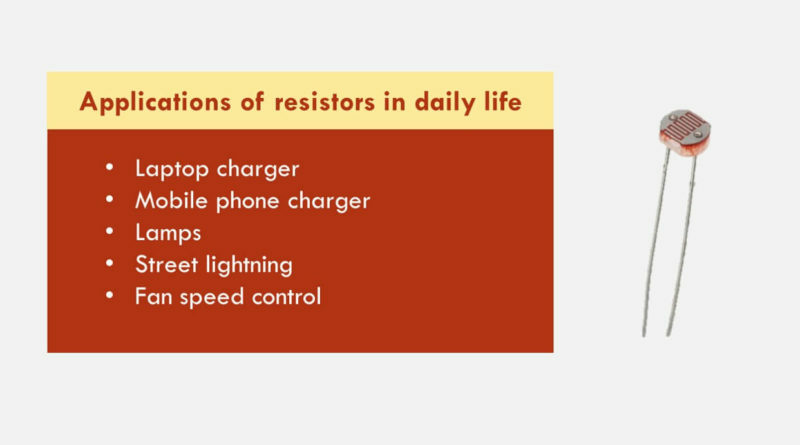 In this article, you’ll learn the top 5 Practical applications of resistors in our daily life. Your laptop charger has tens (if not hundreds) of resistors for controlling current flow through different components. 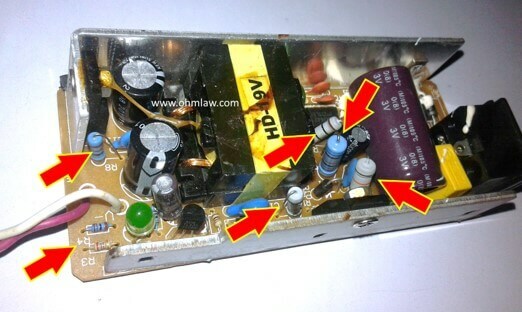 The figure below displays the resistors in the opened laptop charger. Just like the laptop, a mobile phone charger contains a number of resistors that are responsible for controlling the required amount of current. You might have noticed the amount of current on your mobile charger displaying something like 500 mA, 700 mA, 900 mA, 1.0 A or 2.0 A. This is actually the amount of current. A resistor is a basic component responsible for controlling this flow through the mobile phone. 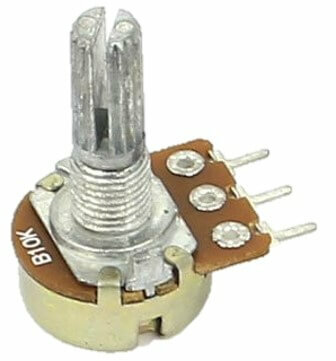 All of us are familiar with the rotating knob that is used for controlling the fan speed. The rotating knob is actually a potentiometer whose rotation changes the amount of resistance. 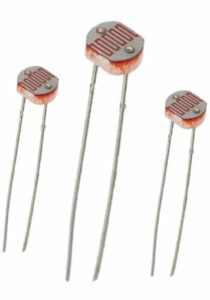 The electronics circuits in CFL, LED and other lightning lamps contain resistors. 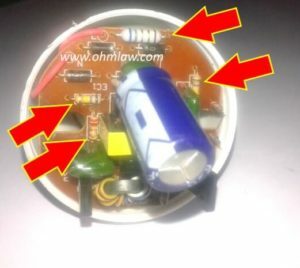 The figure below displays an opened CFL containing metal film resistor (gray). Automatic street lighting system uses LDR (light dependent resistors) in their working. A photoresistor is variable resistance device whose resistance changes with the light intensity falling upon it. During daylight, the resistance of lamps is adjusted to turns off the lights. When the sun falls the resistance also changes, this variation in resistance is used to turn on the lights. Resistors are present everywhere in our life. 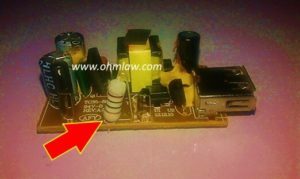 All electronic boards and devices utilize them. Our laptop boards, mobile phone, juicer machine circuits, home accessories all contain SMD resistors. They are used in kettles, lamps, geezers, speakers, headphones and almost all electronic/electrical devices. But what makes them popular is Ohm’s law. To understand more applications have a look at these 12 Ohm’s law formulas. Also, learn the Practical applications of Ohm’s law in daily life.